In 2017, data and information were acquired and developed to prepare the review and update of the preliminary flood risk assessment. This activity included, among others, surveys in local government units in terms of historical floods and changes to the level of flood hazard and flood risk. 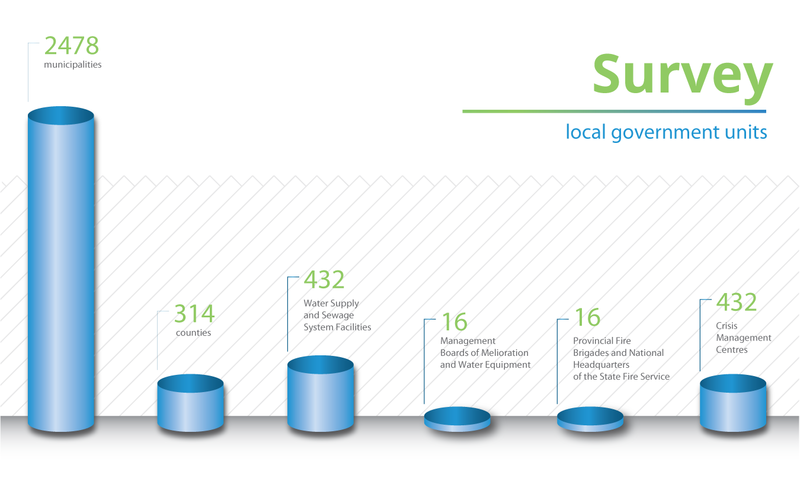 The survey form, on-line and paper, was delivered to 3645 units, including 2792 local government units. Limiting the impact and results of floods. Surveys were carried out by e-mail, mail and by phone. Additionally, the list of local government units with high flood risk was created. These units have been covered by special monitoring. It included municipalities with very high and high flood risk determined within the Flood risk plans for river basin areas and water regions and those where there is high risk of flooding and that were excluded from the Preliminary Flood Risk Assessment carried out in the 1st planning cycle in 2011, provincial towns and cities with more than 100 00 inhabitants. High commitment of participants was noted, which resulted in collecting information for 86.4% of the country. This proves that local government representatives in areas affected by the occurrence of flooding are aware of associated risks. 3217 responded to the survey, including 68% of municipalities and 86% of counties, thereby providing information on 88% of the country’s surface area. Among cities with more than 100 000 inhabitants covered by special monitoring, there is no risk of flooding and undercuts in 9 out of 39 surveyed cities, and 10 have not implemented, or not planning to implement, flood investments after 2010. Interestingly, among water plants and sewage system facilities, crisis management centres, provincial fire departments and land reclamation and water equipment boards we obtained response from only 34% of institutions. Many of them informed us that they had no competence when it comes to the survey subject. A total of 3 639 local government and administration units, local government organizational units and water supply companies were surveyed. 66% of the entities that had received the note informing about the survey completed the survey “Preliminary Flood Risk Assessment”. 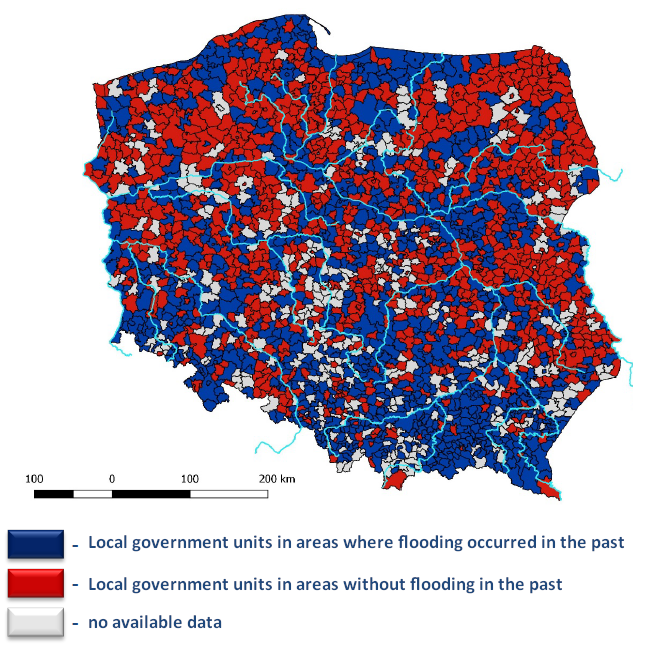 54% of the respondents answered affirmatively to the question concerning the occurrence of flood in the past, which represents a large area of Poland. The highest density of municipalities/counties with historical floods occurs along major waterways. The lowest density is observed in northern and eastern parts of the country. 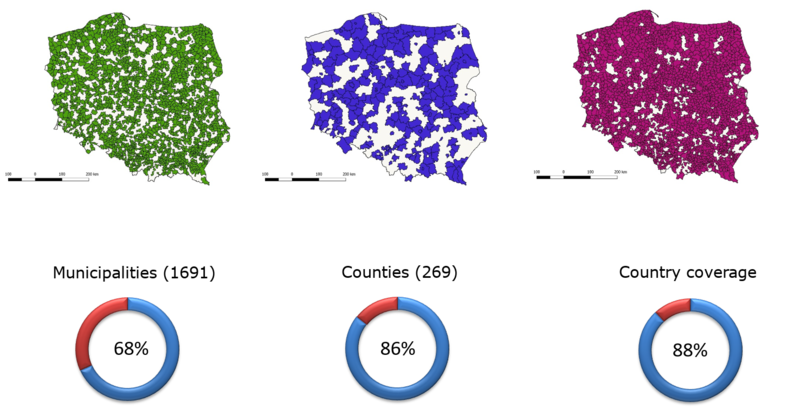 Drainage basins of the Little Vistula River, the Upper Vistula River and the Upper Odra River are characterized by many historical floods, so the issue concerns mainly the southern and south-eastern parts of Poland. The analysis also confirmed media reports about flood phenomena. An example may be the area of Kłodzko Valley where, as we know from such reports, flood events are common and have been reported to Local Government Units. Most respondents pointed to the presence of river floods (41%) and rainfall floods (39%), indicating natural swelling as the most common mechanism (73%). The survey also involved flood investments implemented after 2010 or investments that are planned to be implemented by 2019 and paid from Local Government Units’ own funds. 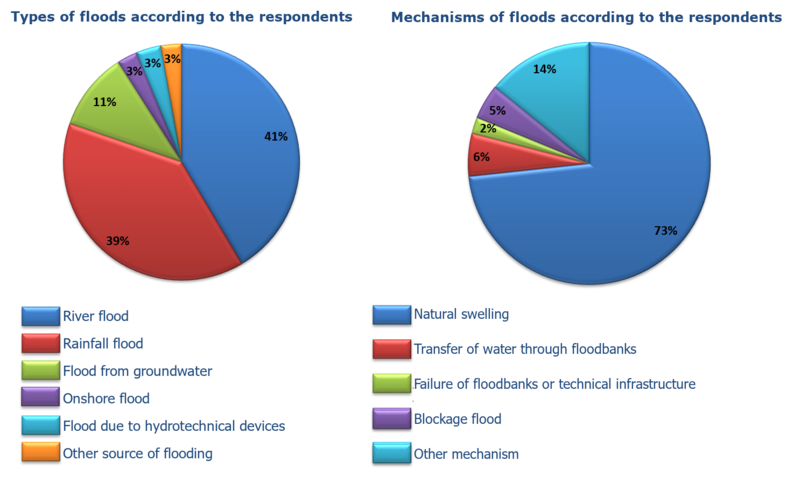 Only 19% of the respondents have implemented flood investments after 2010 or are planning to implement them by 2019.